Cambodia's parliament has approved a new five-year term for long-serving PM Hun Sen, despite a boycott by the opposition over disputed elections. Hun Sen, in power since 1985, is expected to be sworn in on Tuesday. The opposition, who have demanded an independent inquiry into election results, have been absent from parliament since it opened on Monday. Hun Sen's reappointment comes despite weeks of protests over alleged widespread cheating in the July polls. In his speech to parliament, Hun Sen said his new term was "a historic day for Cambodia", adding that the elections were "free, fair, just and transparent". He told reporters on Tuesday that "the door is not closed yet for negotiation with the opposition party, but they have to accept the election results and swear-in first". Official election results show the CPP won 68 seats - a greatly reduced majority - while the opposition garnered 55 seats. The opposition Cambodia National Rescue Party (CNRP), headed by Sam Rainsy, have accused Hun Sen's ruling Cambodian People's Party (CPP) of widespread election fraud. The government has so far rejected the opposition's demand for an independent inquiry. A spokesman for CNRP said on Tuesday that there would be "mass protests in Phnom Penh and nationwide" following Hun Sen's new appointment. Over the weekend, opposition lawmakers held a ceremony at the ancient temple complex of Angkor Wat, promising not to enter parliament until an independent inquiry was held. Tens of thousands of people joined public protests earlier this month over the election results. At least one person was reported dead after clashes with security forces. Correspondents however say that there is nothing in the Cambodian constitution that prevents the prime minister from governing with a half-filled parliament. With state institutions - including the election commission - under the control of Hun Sen, protests are the only way opposition supporters can challenge the result, correspondents add. 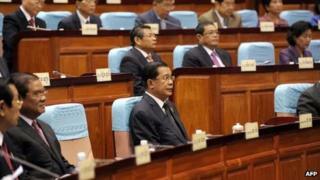 Hun Sen, 61, has vowed to be stay in power until his 70s.